Russell Westbrook takes on a Phoenix defender during Sunday's 124-103 win. Serge Ibaka grabs a rebound away from Phoenix center Tyson Chandler. Kevin Durant dribbles around a Phoenix defender as teammate Steven Adams sets a screen. Oklahoma City had a lead heading into the fourth quarter and this time they kept it. In previous games the Thunder had squandered leads it should have kept. The end result was three straight losses on the heels of three straight wins. On Sunday, it started off like a repeat of the past three games. The Thunder threw a scare into the fans during the first quarter after taking a 15-point lead. Hello, deja vu. By the end of the quarter, the Phoenix Suns knotted the game at 29-all. Not again? Yet, this time Oklahoma City responded well and took a 60-54 halftime lead. By the end of the third quarter, the Thunder was up by 12, 89-77 and never trailed again. They put the pedal to the metal and didn’t let up this time as Oklahoma City won, 124-103, to improve its record to 4-3. It didn’t hurt that the second unit played much better and the dynamic duo of Kevin Durant and Russell Westbrook combined for 53 points and 24 assists. This game provided ample proof that the Thunder needs to pony up the dough when contract time comes around for both players. 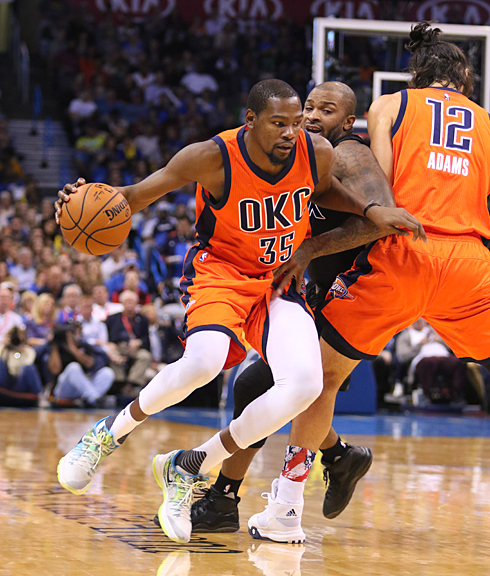 Helping the cause was Oklahoma City’s defense, which forced 23 turnovers resulting in 30 points for the Thunder. On the flip side, the Thunder committed only 15 turnovers, which is marked improvement over previous games. Westbrook acknowledged Oklahoma City’s aggressive play allowed the Thunder to keep its fourth quarter lead this time. “We did a better job not letting people come at us, which lets us do what we do, which is getting out in transition and getting steals,” he said. The Thunder finished with 14 steals against the Suns, including four from Westbrook and three each from Dion Waiters, Durant and D.J. Augustin. Keeping the fourth quarter lead was due, in part, to the second unit, which Durant praised during post-game comments. “When you play with confidence, you can do a lot. I thought our second unit did a great job of pressing that lead up. Phoenix is a good team. They are quick; Eric Bledsoe is one of the fastest people I’ve ever seen in my life. Tyson Chandler has been a great, veteran player for them. I think our guys like Mitch [McGary], Enes [Kanter], and Dion [Waiters] played well and handled themselves well,” he said. At least for one game, the Thunder has its swagger back while demonstrating it can keep a late lead and cut down on turnovers. It sounds simple, but this is the NBA where anything can happen.